The junior cycle of post-primary education in Ireland is changing. From 2014, the new junior cycle will feature newly developed subjects and short courses, a focus on literacy, numeracy and key skills, and new approaches of assessment and reporting. The information below provides you with some information about the changes occurring in our school. What is the New Junior Certificate known as? What subjects have changed so far? English, Science, Business Studies, Gaeilge and French and Art. Students who entered Form 1 in September 2015 are doing the new English course. Students who entered Form 1 in September 2016 are doing the new English, Business Studies and Science courses. Students who entered Form 1 in September 2017 are doing the new English, Business Studies, Science, Gaeilge and French & Visual Arts courses. What subjects are being introduced in 2018? Maths, Home Economics, Music, History, Geography & Technology. New subject comprising of CSPE, SPHE and PE, initially 300 hours over 3 years moving to 400 . Where can I see the subject specifications or curricula? Where else can I get information on the new Junior Cycle? 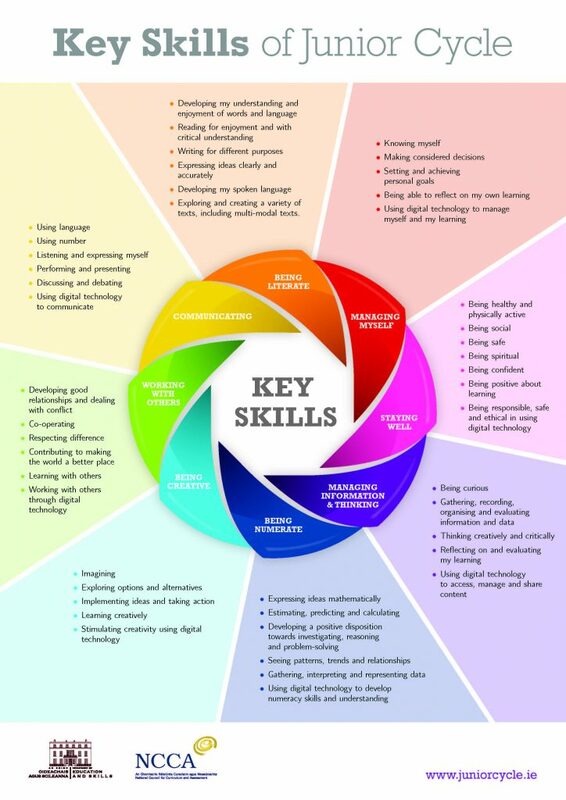 What are the 8 Key Skills and 24 Statements of Learning feature spoke about in the new Junior Cycle? 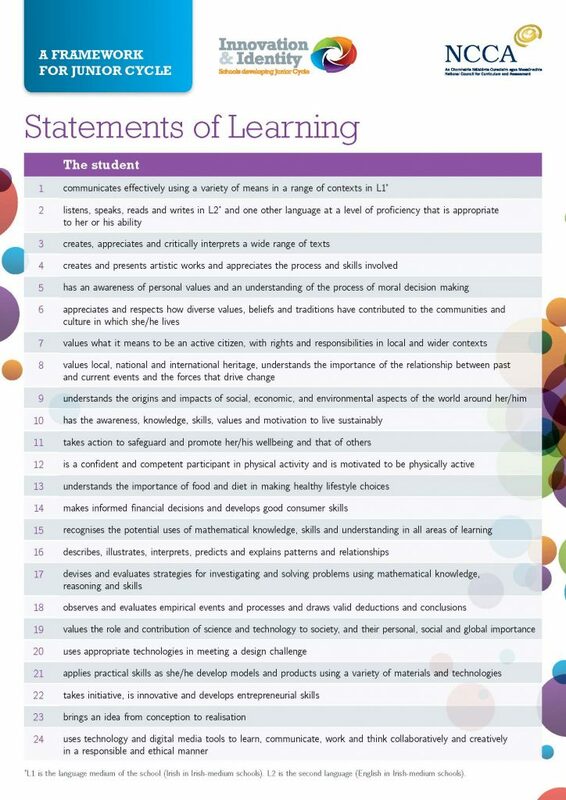 Across all subjects and across the school students should be given the opportunity to master 8 key skills and meet 24 statements of learning. The Key Skills can be found here and the Statements of Learning here. How many subjects do current Junior Certificate/Cycle students study? Forms 2 and 3: 11 as well as RE, SPHE and PE. Form 1: 10 as well as RE and Wellbeing which includes CSPE, SPHE and PE. What are other areas of learning? Activities that students are involved in that fit in with the 8 key skills and 24 statements of learning, such as partaking in (but not limited to) Sport, Green Schools, Student Council, and School Choir to name a few. What is the minimum length of class period in Junior Cycle? This is a Classroom Based Assessment. It allows students demonstrate skills ad concepts and their ability to apply them in ways that may not be possible in standard exams. How many CBA take place per subject? Will all subjects have two CBA’s? Yes, but some subjects where the creation of an item for correction is part of the exam e.g. Visual Arts, will form the second CBA. In class time and within a time frame set down nationally. What is an Assessment Task? How will the final examination in June differ between Junior Cycle and Junior Certificate? No exam will be over 2 hours in duration. Only English, Irish and Maths will have Higher and Ordinary Levels. What are the grade descriptors for SEC examinations? How many days may a school close in 2017/18 for Junior Cycle activities?